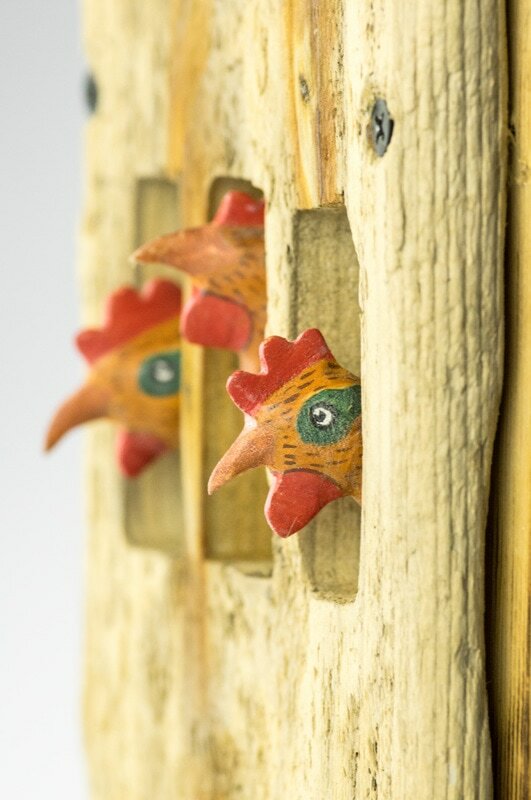 Change your perspecive and look at things from a different place, this show enjoys the unusual and the unexpected. 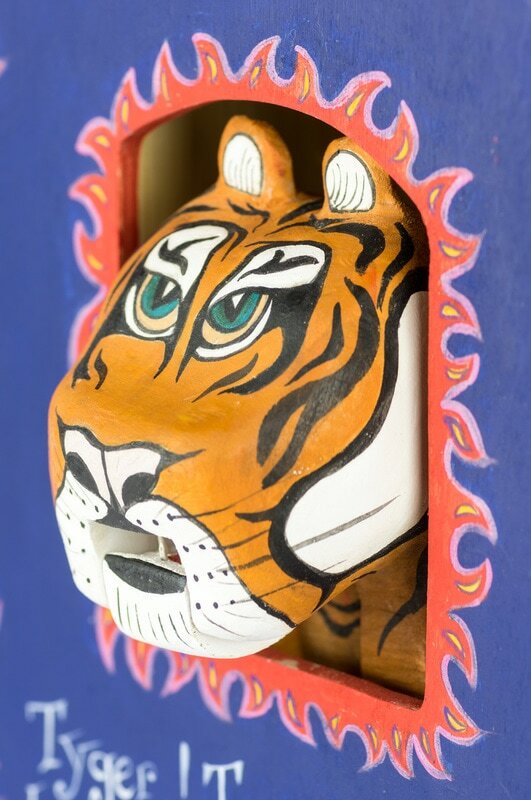 ​"'Cheshire puss', she began...'Would you tell me, please, which way I ought to go from here? '"; so asks Alice as she reaches a crossroads in her Wonderland adventure. It was this feeling of uncertainty that I faced as I explored the city of Shanghai during a residency there in November 2012. Language was a barrier and Chinese characters, rather than roman letters, were indecipherable. 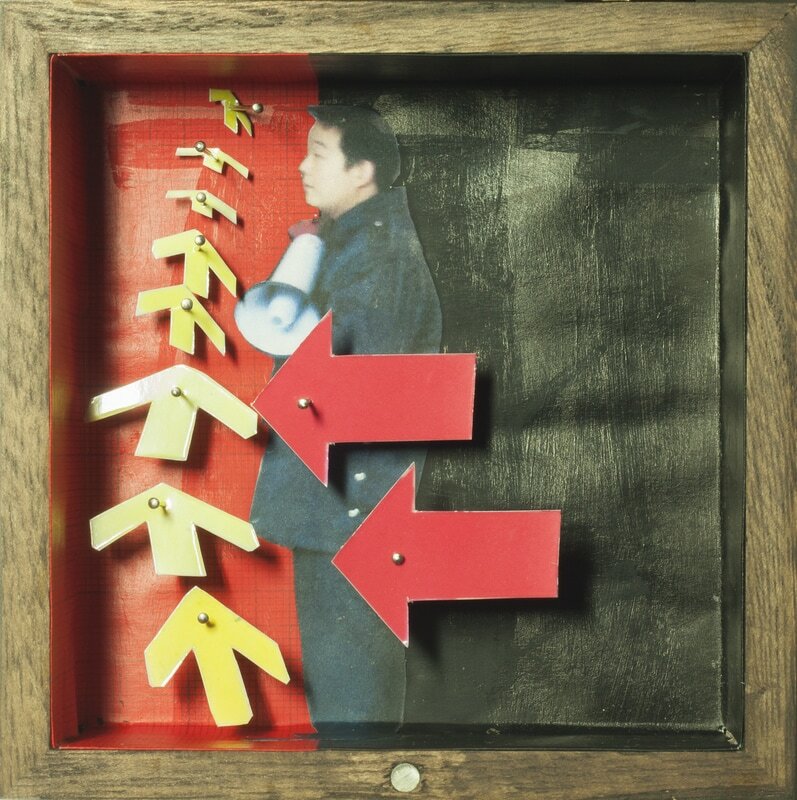 The city buzzed around me and arrows as an internationally recognisable symbol became my guide. These arrows have been paired with quotes from Alice's Adventures in Wonderland, along with images from my travels in Shanghai to convey a series of experiences of Shanghai. From the feeling of my explorations being restricted on a guided tour, to the sensation that everyone is constantly on the move, or a pleasant morning ballroom dancing in a park, each box tells the story of my time exploring the city. 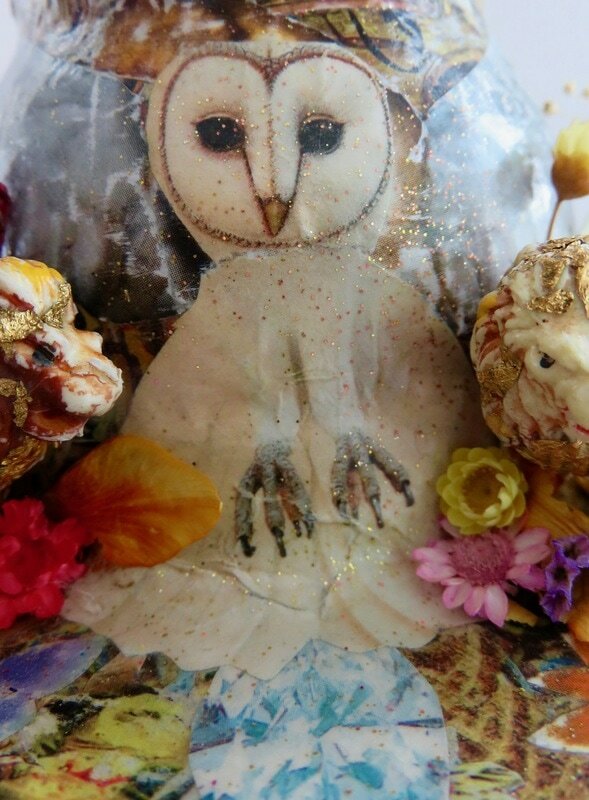 ​Central to my practice are themes of fertility, beauty, reproduction, change and transformation, which I express using plants and flowers as symbols, most of which are grown locally and worked with seasonally. The notion of plant evolution and adapted seed dispersal methods fascinates me. There are seeds that drill themselves into the ground (and animals) and seeds that use hygroscopic movement and ‘walk’ along the ground away from the plant, as well as seeds dispersed by the wind such as sycamore, dandelion and rosebay willowherb. 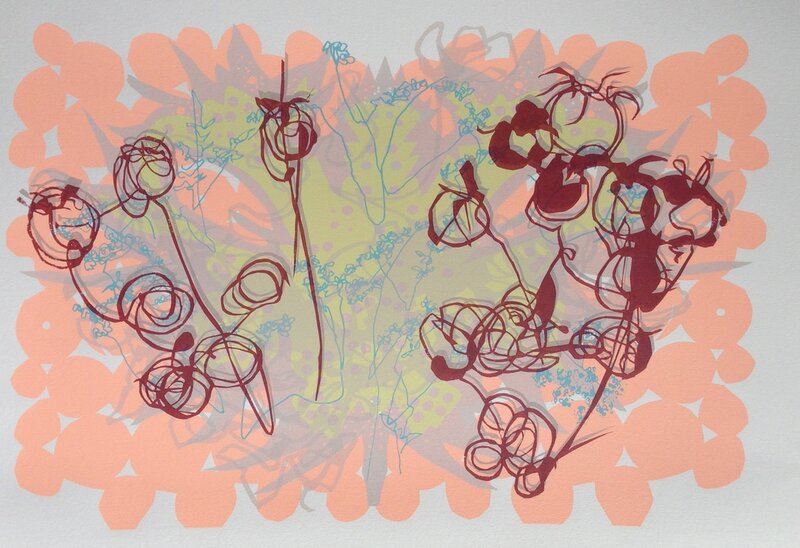 Detailed observational drawings from life or found microscopic images are then progressed into hand made papercuts and abstract patterns and screenprinted using translucent colour, line and layers. Drawing persists in my work as an underpinning medium for its directness, purity and simplicity. 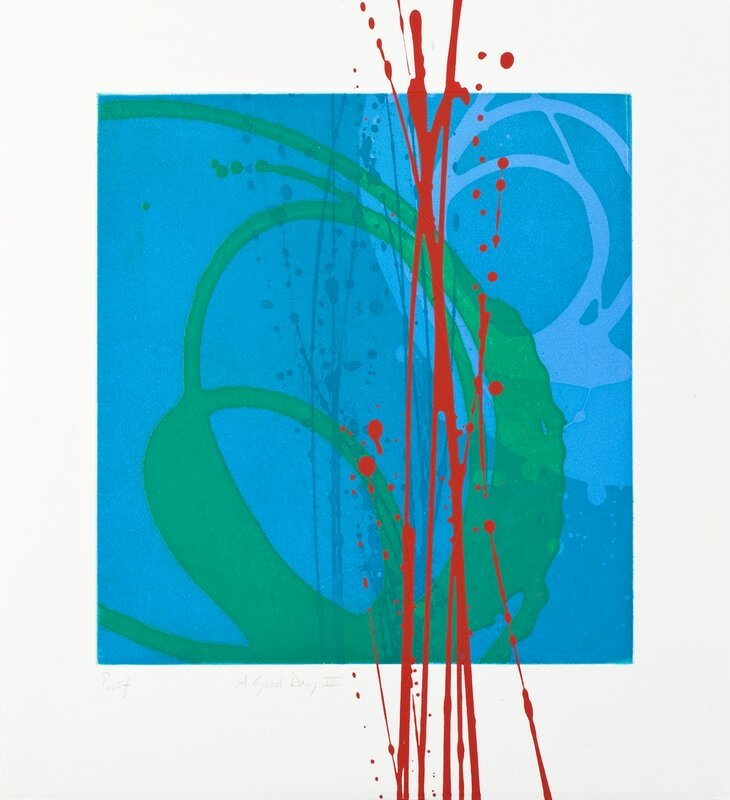 Prints can have as many as twenty different layers and I often work in series, rather than making an edition of prints, working using different colour harmonies and dissonance and manipulating the position of different elements within the composition. Sometimes the final images may not seem to relate directly to the appearance of the original flower, but the forms originate there. The prints are designed to seduce, as a flower seduces a bee for pollination and reproduction using colour, scent and form. 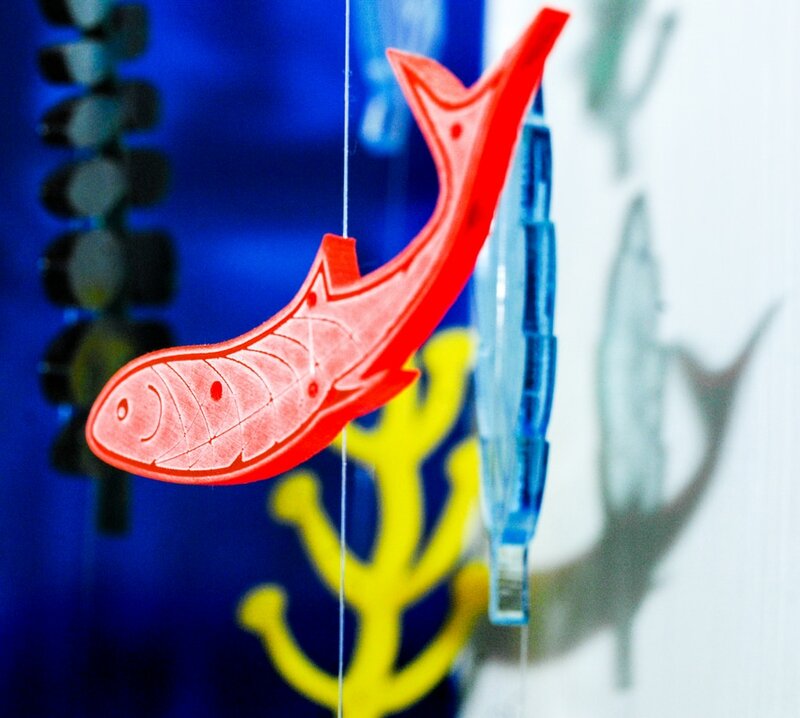 I have been making mobiles for 15 years, initially using hand cut paper, and more recently using laser etched and cut perspex shapes. I love pattern, and I attempt to create fragmented floating, moving patterns with my mobiles and boxes. Balance is key, as well as shapes and colours. 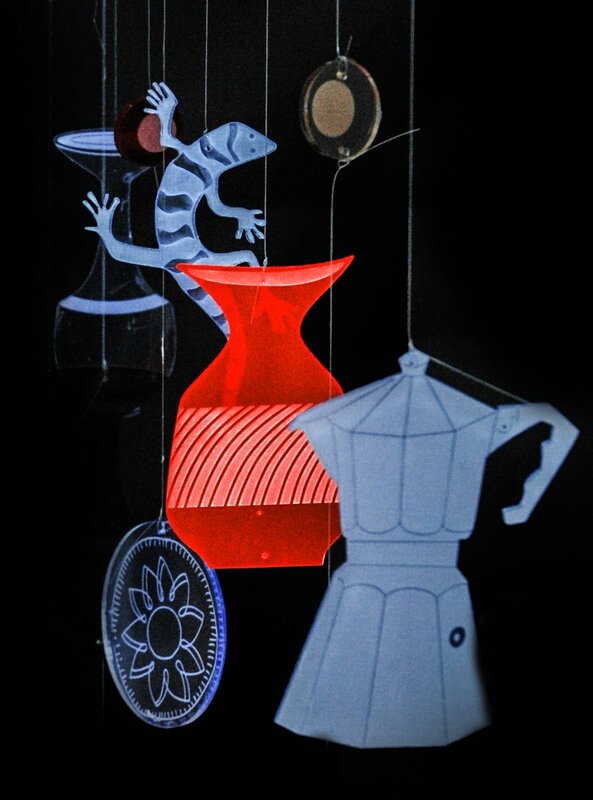 And with the transparent perspex light plays an important part; the mobiles can look very different according to the changing daylight and evening electric lighting, and according to movement in the air currents. I love the Alice in Wonderland feel of the Curiouser and Curiouser title. 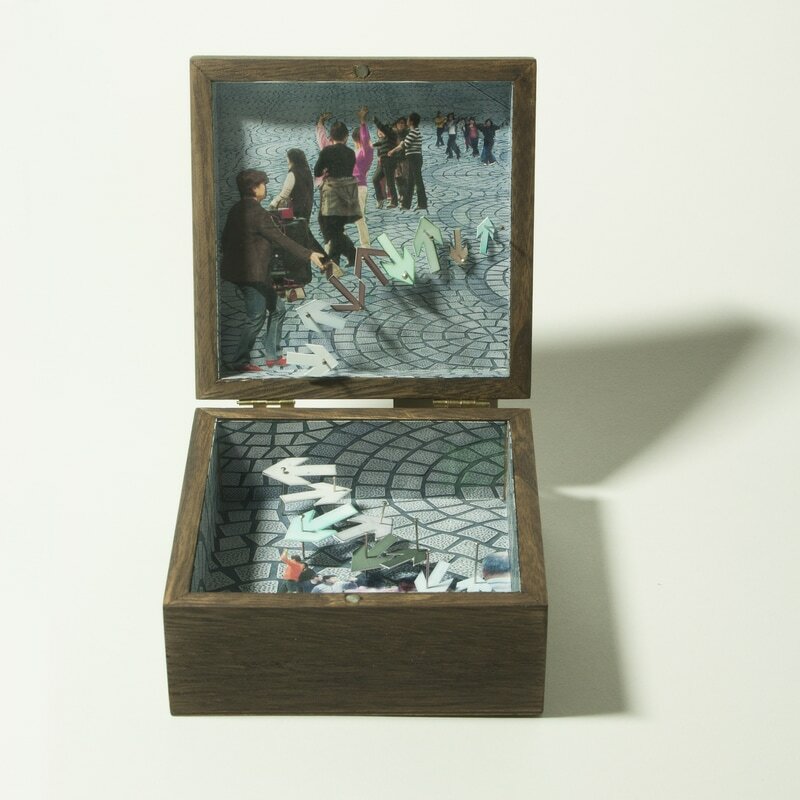 It conjures up changing scale, which is relevant to my work which can be like creating a little world in a box. It also links to the slight optical illusions of some of my work: layers can be seen behind layers, shapes can look like they are literally floating in the air. It also relates to some of my subject matter: astronauts and flying saucers, birds and their nests floating next to airplanes, animals camouflaged and hiding in a jungle etc. So I intend to catch the eye of a passersby who might not be sure of what they've just noticed and want to stop to look a bit more carefully.... And become entranced by a world that is curiouser and curioser. Flights of Fantasy - This collection is about harmony in absurd places with incredible characters. It's about the rare moment of magic when improbable partnerships are made and anything appears to be possible, if you believe, and set differences aside. 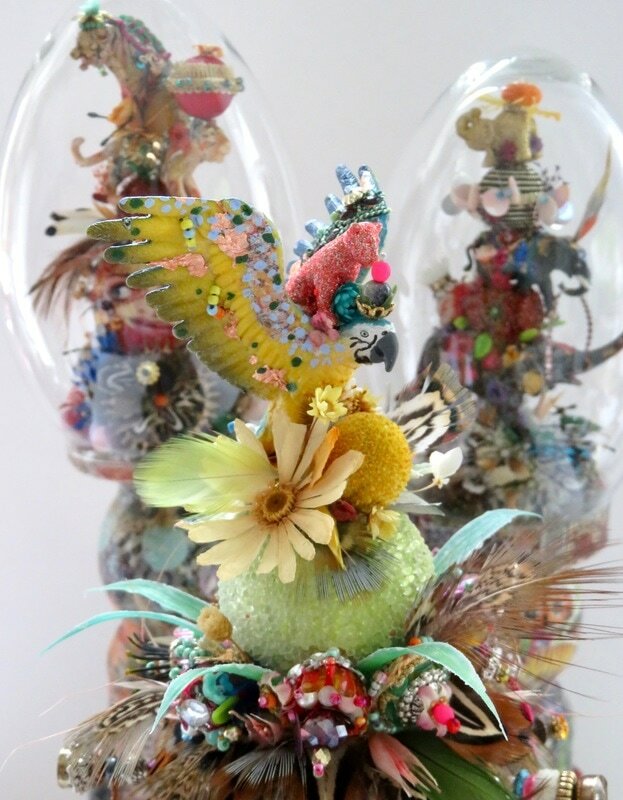 Stories are told, pairing traditional foes, outsized creatures, miniature animals and exotic florals, using found and collected objects and mixed media, encased in glass domes. 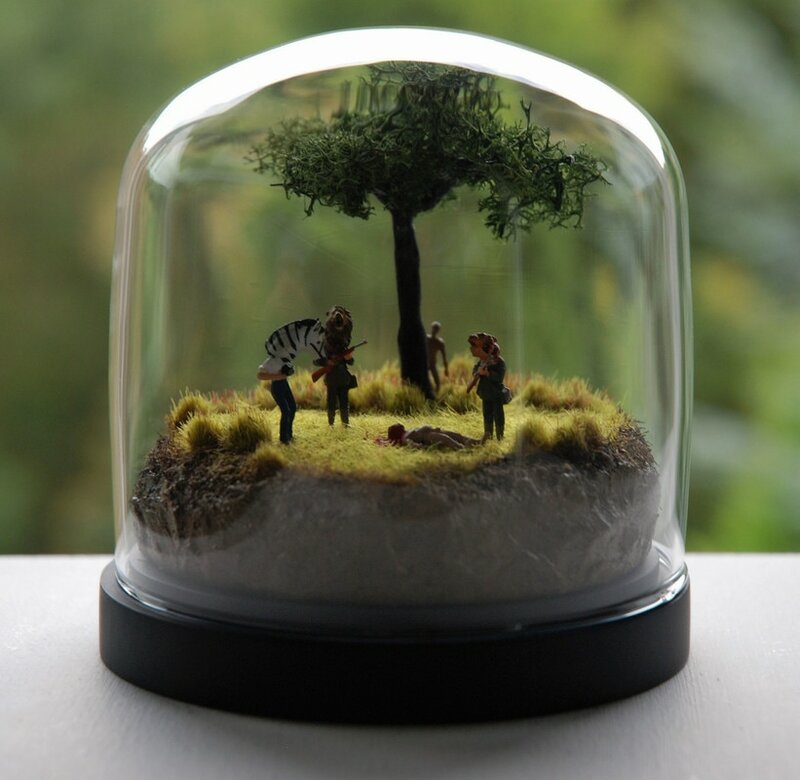 West Yorkshire based miniature world artist. 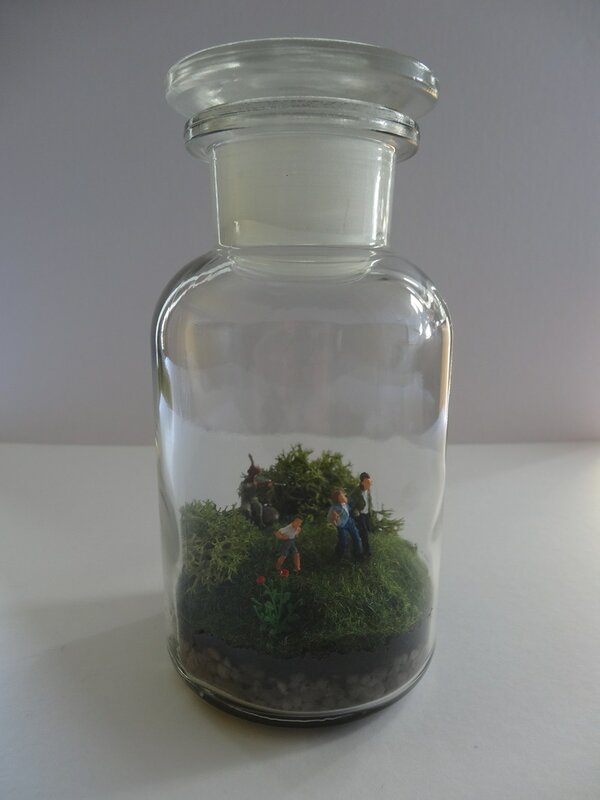 Fascinated by the way life in miniature evokes feelings of wonder and enchantment, I like to create scenes replicating daily life but with a dark twist. A collection of work exploring our relationship with animals. 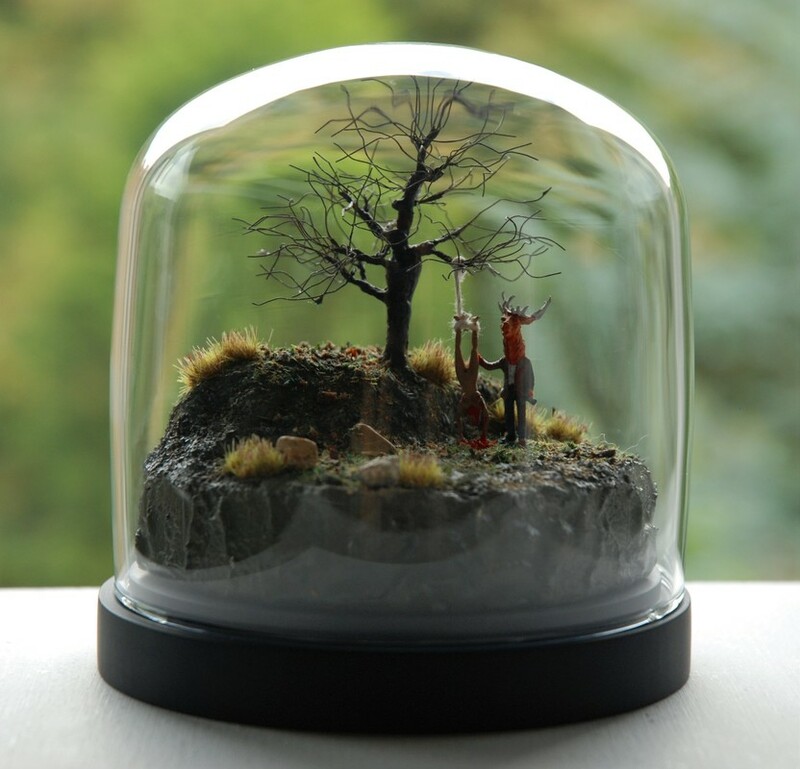 Miniature worlds, in which animals have taken on human characteristics and our roles have been reversed. A bizarre amalgamation of human and beast in scenarios that are oddly familiar, yet the warped reality plays with our perception of the world and our place in it. 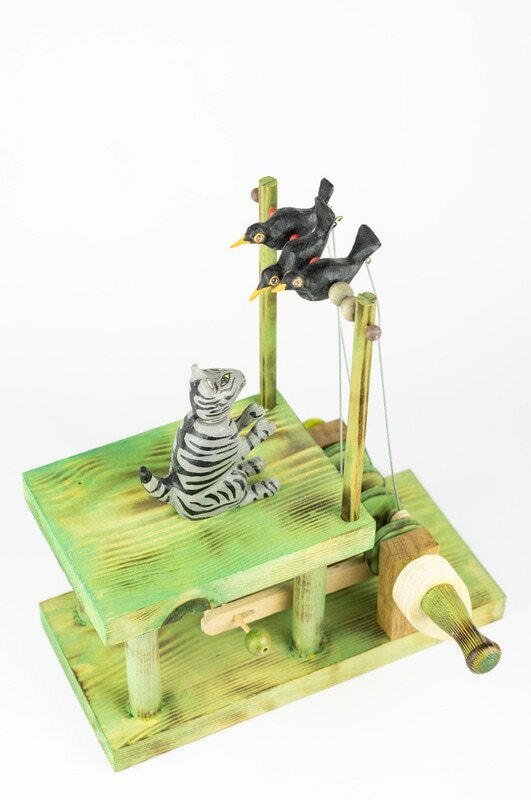 Inspired by taxidermy, the bizarre and animal cruelty, this darkly humorous series will intrigue, amuse and provoke contemplation. The dominant theme of my work is the nature of human experience, creating tensions and harmonies through the use of colour and form. Much of the initial inspiration for my work comes from places I have visited and have significance to me. I often use photographs as a starting point, and as the compositions develop, I combine elements taken from the photographs with imagery drawn from personal experience. I am fascinated by the possibilities of colour and colour relationships and the infinite potential they have to create dynamic connections and reactions. My screen prints and lithographs are made from a series of separate hand painted stencils, one stencil for each colour printed. There are often numerous colour layers. In ‘Striking a Balance I’ and ‘Striking a Balance II’ there are between 12–14 colours. 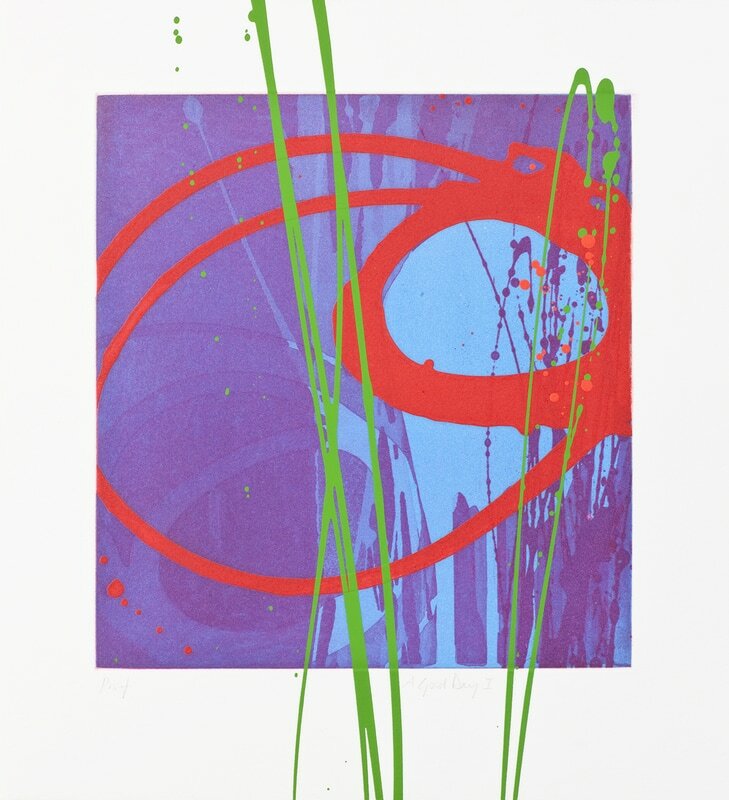 The ‘Venturing’ series of lithographs have also been made with several colour layers, and have an additional screen printed element on top. 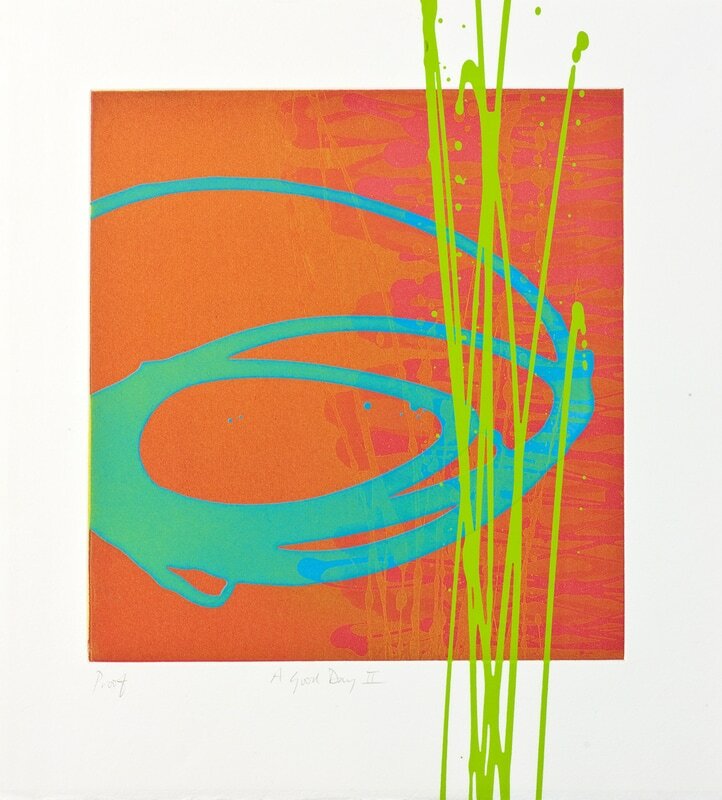 The prints in the ‘A Good Day ‘ series were each made using two copper plates. Both plates were inked up and then one printed on top of the other. These prints also have an additional screen printed mark on top. Many of my prints are made using a combination of printmaking processes, each process giving it’s own distinctive quality. 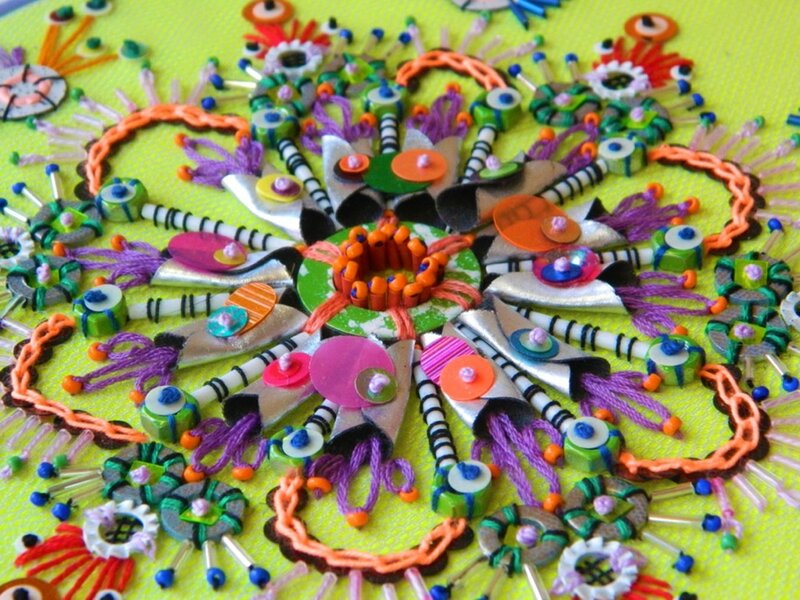 ​Jessica is a textile artist from Whitby, North Yorkshire who creates highly tactile artwork with a strong focus on colour, texture and mixed media materials. 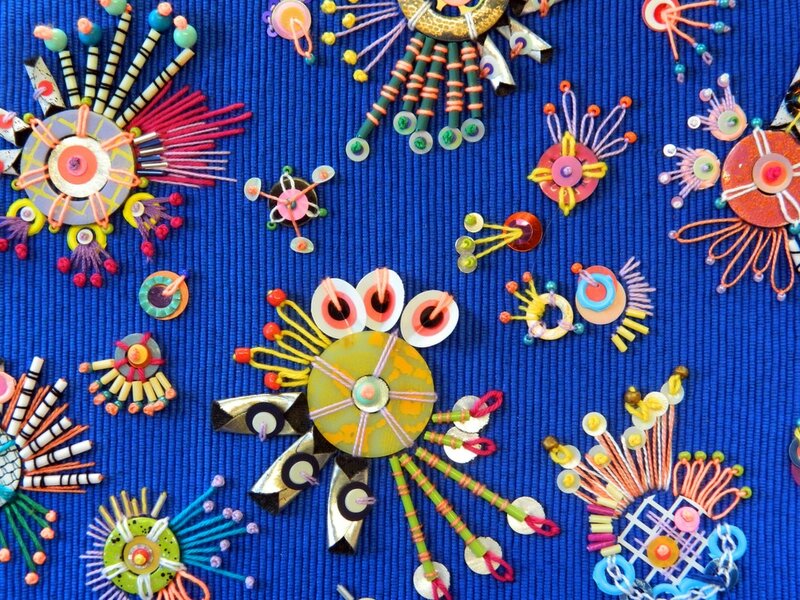 Her textiles use a combination of processes including traditional hand embroidery techniques, hand dyeing, and embellished surfaces – that utilise unconventional materials. 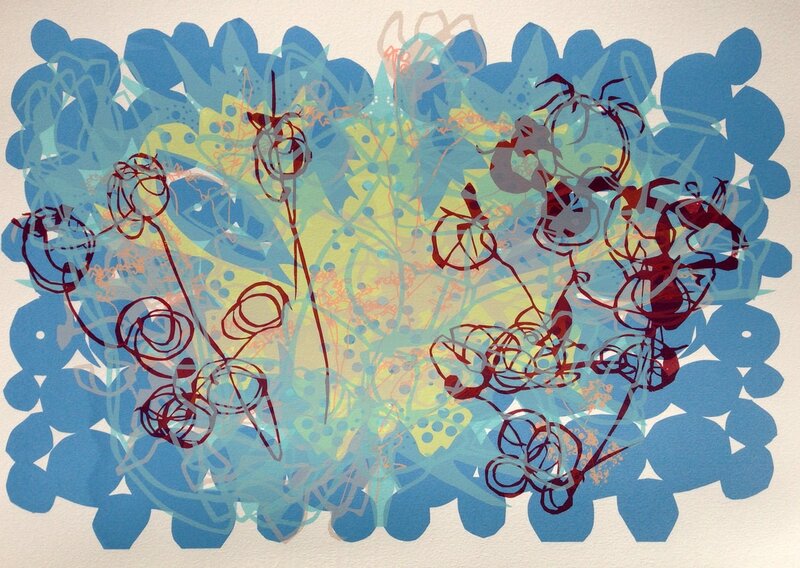 Jessica’s “Floral Garden” collection is a mixed media body of work exploring the idea of floral shapes and patterns. Each textile piece is individually framed within an embroidery hoop to tie in the traditional roots of hand embroidery that underpin each piece. 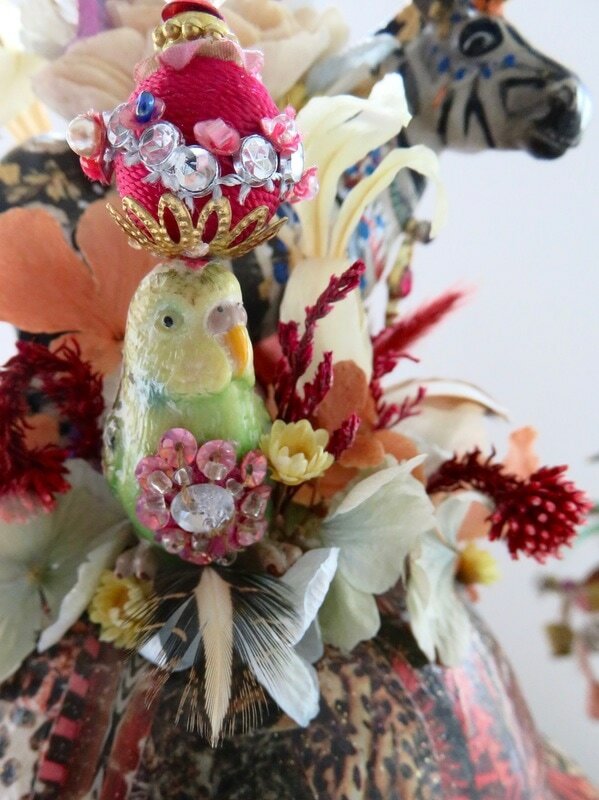 Many of the embellishments used within this collection are created using unconventional materials such as painted metal washers, hand dyed plastic cotton buds and parcel ribbon. 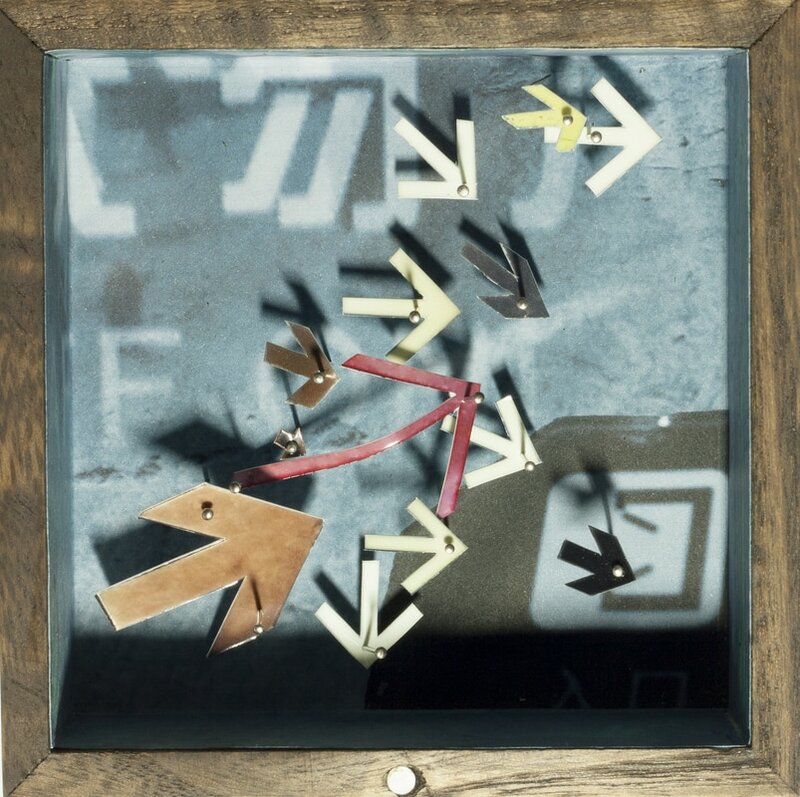 This juxtaposition of unusual media with traditional techniques invites the viewer to look closer – creating curiosity. 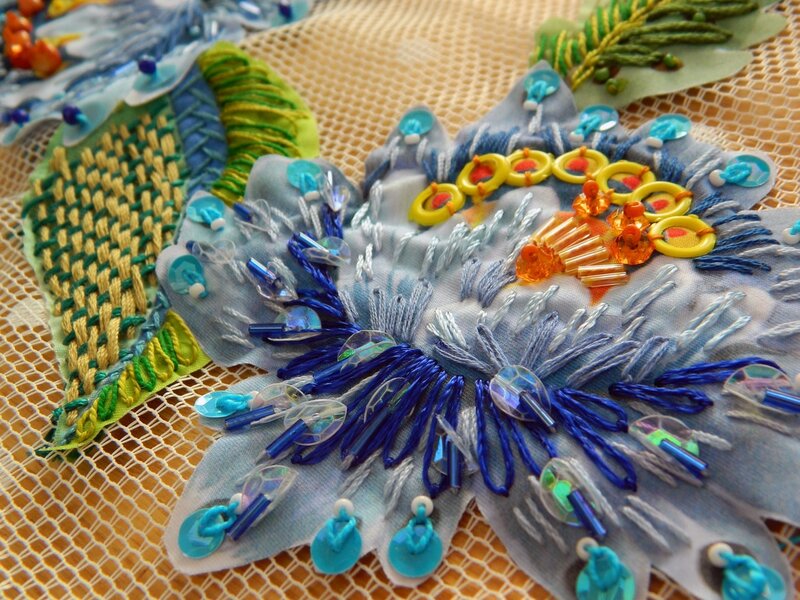 All of Jessica’s textiles showcase meticulous hand stitching and intricate detailing. Each single stitch provides an added element of texture and colour to the work as a whole. 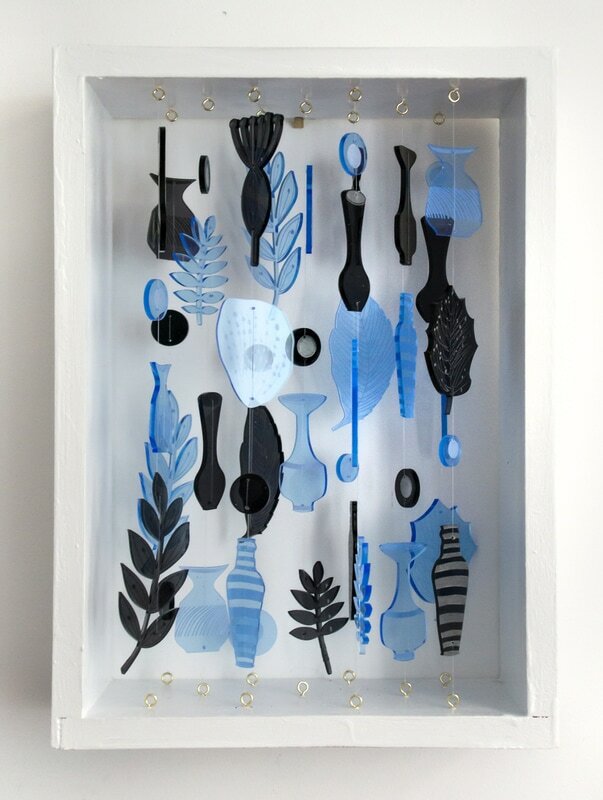 Colour is an important aspect within her work – she uses many strong and highly contrasting colours, creating a very vivid and saturated colour palette. 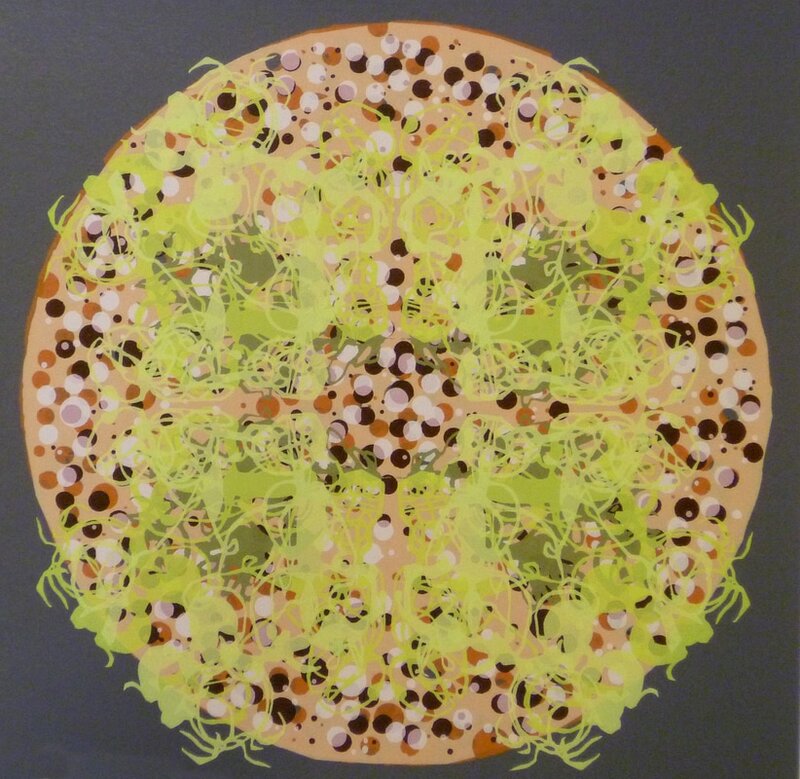 Jessica’s artworks are a textural and visual feast, saturating the senses with colour and pattern.